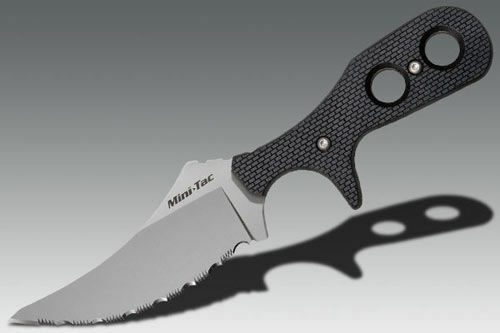 The Cold Steel mini tac knife provides a 3 3/8” blade, and weighs in at under 2.5 oz; as the name implies, it is extremely tactical and can be used in a number of situations, for different tasks. The knife also features exterior shears, so you can wear the blade on your clothing, making skinning in the wild easier to do. The blade’s direction and G10 design, not only make it simple to swipe and skin nearly any surface, but also make the knife easy to use for cutting, or performing other tasks with it also. Below you can see our comprehensive review. The blade features an extremely sharp edge same like with curved knife. This means you are going to be able to dice, chop, cut, and of course skin, nearly any animal fur, or the knife can also be used for gutting if you are a fisherman. The knife provides an extremely ergonomic grip along with a rugged design, so you do not have to worry about breaking or damaging the knife, regardless of the situations that you find yourself in when you are using it. The batoning capabilities are also a nice feature that you will appreciate if you are one for the outdoors. The comfortable, ergonomic grip design, also allows you to grasp the knife tightly, so skinning is a breeze, regardless of how long you are using it, or what type of fur you are skinning with the knife. The comfortable grip design also eliminates issues such as bruising or otherwise injuring your hands when using the knife blade for extended periods of time. In addition to this, the design is extremely tactical, allowing you to hold the knife nearly in any position, so you can easily skin the fur, or other items that you are working on with the knife. The quality of the design is a nice feature, and the top of the line stainless steel blade finish is something that you can’t beat when you are looking for durability, and something that is not going to rust over when you are using it in wet or otherwise difficult conditions when you are using the knife outdoors. The sturdy and light in weight design, is also something that you won’t find with too many other blades. At only 2.2 oz, you can’t find many blades out there which are lighter in weight than this one is. In addition to the quality of the design, well made blade, curve, and ergonomic grip, you are also going to find that this knife is made by a trusted manufacturer in the industry. Along with this, you are going to receive a warranty with your purchase, so you can use it as desired, and not have to worry about wasting your money or damaging the knife or the blade after only a short time of use or ownership. In comparison to other skinning knives on the market, you can buy Cold Steel Mini Tac Skinner Serrated Knife for a reasonable price. Indeed you are not going to find too many blades that will match the power, dexterity, and high end design as this knife offers!